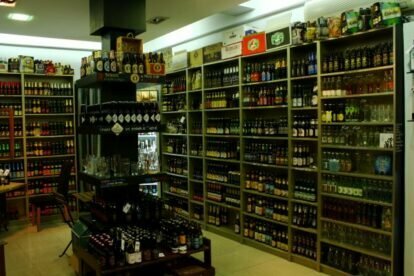 If you’ve read about other places I’ve spotted so far like Cervezorama (check the Cervezorama article) you might feel inclined to burst out, beer again? Well get used to it cause this one will hopefully not be the last place I find that quenches my thirst, and everyone likes a big cold one, or? (Yes, still talking about beer). Unlike Cervezorama the size of this store is a little bigger but then again this is not a pure beer store, as the name implies (mas que cervezas = more than beers, in Spanish). They also carry different types of gins and tonics which is another drink that has seen its popularity skyrocket for the last couple of years. You want more? Okay, they have different beer glasses for sale and they even go as far as to sell snacks like cheese that goes good with the beer. The whole, “cheese is best with wine” bubble should burst pretty soon. If you’re a picky one with what you marinate your tastebuds in you’re in luck, they will by default have something for everyone, seeing as the selection is spread amongst every continent of the world (well except maybe Antarctica). They even have gluten free beer if that is one of your issues. Everyone has the right to beer arms.